Self Wipe Toilet Tissue Aid from HealthyKin.com is the answer to personal hygiene when reaching is difficult. The ergonomic shape helps those with limited dexterity. 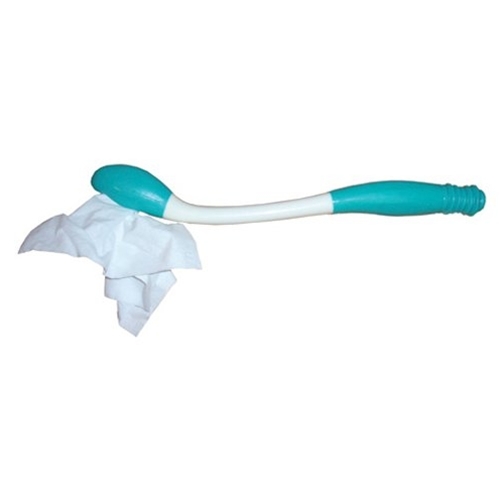 The soft flexible head grips toilet paper, tissue or pre-moistened wipes securely. It uses a unique release button for fast, sanitary disposal. Oh my goodness! This is the greatest thing since sliced bread! It was a disaster Idina this with toilet papER because of the friction, but if you wrap a wipeyear around it, (be sure to tuck it in the back firmly) you will see whyou I am overjoyed with it! I how this helps! Love love love my extended arm! It really works but the release part quit working after a few days. I just wish they would make them to either fold up or take apart so I can take it with me when I'm away from home! It won't fit in my purse and I need it all the time, not just at home. I have arthritis in my back and shoulder so this is just what I needed. You don't need very much t. paper or it won't stay tucked in. They reccommend only 6-8 sheets. The release mechanism does not work that well, but other than that the product is great! My wife has used this same type for years and they work so well to help her in all her disabilities keep being able to help herself. Wonderful price on it too. As embarrassing as it is I love this product! Worked well for cleaning(broken arm and wrist) Release button stops working,not so good, this part needs to be fixed.